The Peiffer family’s professional tradition went back to a pharmacy in Balve in 1790. 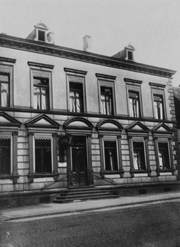 In 1832, the family founded a pharmacy in Neheim. It was called the Biber-Apotheke because it produced and sold a special salve made from beaver fat derived from beavers then still to be found on the Ruhr river. 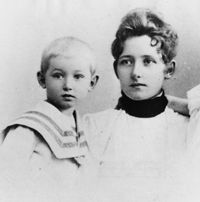 Max was a delicate child, often sick. He was very close to his mother. A younger brother died in early infancy. The artist’s father became ill. The pharmacy had to be rented out, and the small family moved to the spa town of Wernigerode in the nearby Harz mountains, where the boy went to school. The artist’s father died in 1903. His loss caused great pain to the boy, who would often speak of the loss, even in old age. When he was ten, his mother gave him a box of oil paints and Max began to paint: trees, gardens, and cemeteries. He was deeply impressed by Arnold Böcklin’s Isle of the Dead, and the painter’s works inspired his first painting Pan im Schilf (Pan in the Reeds). His mother remarried in 1906, taking as her second husband Dr. phil. Heinrich Watenphul. He was from Kreuznach an der Nahe, and was schoolmaster of the Quedlinburg Gymnasium, where the boy now was to go to school. Max’s half-brother Heinz Watenphul was born in 1907.